Five Ways, Wolverhampton in 1889, showing the 400m route between number 64, Canal Street (home to the Berenstein family), and St James’s Square (home to Rabbi Isaac Barnett and Wolverhampton’s earliest synagogue). (c) Crown Copyright and Landmark Information Group Limited (2016). All rights reserved. 1889. My PhD research focuses on a small section of Wolverhampton town centre in the nineteenth century that was well-known – perhaps notorious, even – for it’s substantial Irish immigrant population. “Carribee Island” and the “Stafford Street district” became by-words when any sort of unrest occurred amongst Wolverhampton’s Irish. My cursory go at statistics so far shows this to be well justified – although usually a mixed population, there are some streets which are entirely of Irish stock. It’s often the case though that the poorest part of town – and in Victorian times, the area where the lodging houses were – were inevitably (and sadly) the welcoming point for all new arrivals and immigrants. I think “Alpha” and “AB” in the examples below, for example, were probably new arrivals in town – skilled workers, looking for something good. I’d love to follow up where this pair ended up. It’s one of the main reasons that the Irish immigrants moved to the area – their absolute poverty meant that they often couldn’t afford to move on. But these weren’t the only immigrants in town – alongside those from neighbouring counties and further afield, there were others from much farther away, who ended up in the Stafford Street district of Wolverhampton for one reason or another. Some were born abroad but are of unsure nationality, like John Maloney, born in America in 1802 but living as a bricklayer’s labourer at 63 Littles Lane in 1851. His name suggests Irish roots. Wolverhampton has long had links with Wales given its wool-marketing history, and in the same street there are seven Welsh families or individuals in that year. More unusual in the 1851 census are the glazier Levy Berenstein and his wife Henda, who lived at 64 Canal Street with their children Symon (17), Emma (13), Wolf (11) and Simeon (6). All of these were born in Prussia, as was their lodger the rhubarb hawker Wolf Lipman. The other lodgers at the family home were Samuel Weinberg (born in Poland), Benjamin Blysman (Holland) and Henri Jacob (Turkey). All are labelled “not British subjects.” These are not, of course, names typical of their countries but are very Jewish names. I’m not sure what prompted their removal to Wolverhampton some point between 1845 and 1851 – although Frederick William IV of Prussia did promote the exclusion of Jews from certain areas of Prussian society, this era of European revolutions actually saw much greater civil equality for Jews in Prussia. The Jewish Cemetery, Blakenhall. Wolverhampton Archives and Local Studies, ref P/9261. At this stage there was no synagogue building in Wolverhampton, and it’s believed that the small Jewish community met in the house of Rabbi Isaac Barnett, in St James’s Square, Horseley Fields. There was also a gift in 1851 by the major landowner in the area, the Duke of Sutherland, of a narrow stretch of land to act as a Jewish cemetery in Blakenhall. It’s still there, off Cockshutt’s Lane. So – the Berensteins didn’t necessarily locate themselves on Canal Street for convenience. The first Jew found recorded in Wolverhampton is probably the Russian-born Levi Harris, noted in an 1838 trade directory as a clothier in Great Berry Street – now Princess Square, so just around the corner from Broad Street, then known as Canal Street. By 1850, Rabbi Barnett (born in Poland himself) was conducting worship and and lectures from St James’s Square. In the religious census of the following year, 15 people attended morning worship and 12 in the afternoon, although the average was more like 20. St James’s Square, Horseley Fields, site of Wolverhampton’s first synagogue – probably in the home of Rabbi Isaac Barnett. Photo from Bev Parker’s History Website. The synagogue advertised for someone to act as reader and shohet (someone who could slaughter animals in kosher fashion) for the synagogue at £52pa (a DL Davies is listed as contact), but remained few in number. The lease expired at St James’s Square in 1857 and an appeal was made in the Jewish Chronicle for donations to fund a brand new synagogue. The extensive regional network responded to the wardens (Simon Aaron, I Cohen and Emanuel Hart) and by May 1858, a foundation stone was being laid on a site at the corner of Fryer Street and Long Street – just off Canal Street. If all my surmising is correct, the Berensteins and their lodgers now had a very local synagogue to attend. This isn’t just a matter of convenience – many Orthodox Jews still insist on living within walking distance of their synagogue as driving or riding would be considered work, out of the question on the Sabbath. That’s one of the reasons at least for the clustering of Orthodox communities – Stamford Hill in North London is a prime example of this. In fact, the journey from front door of no.64 to front door of the new synagogue was less than 75 metres, compared to 400m to St James’s Square. This was a comparatively civilised section of Canal Street by now – some old houses in the street, in front of numbers 61-64 had recently been removed, turning the alley behind them into a wide pavement. Fryer Street itself was a newly-made road as well, appearing for the first time on Hoggar’s 1851 map. It was constructed out of ground marked 50 years previously as Fryer’s Brickkiln- most likely related to the important Fryer family of Wolverhampton who later became eminent bankers in the town. The route from 64 Canal Street to the new synagogue. Skip forward to the 1861 census, and we find a Levi and Hannah Bernstein again in Canal Street. Whereas Levy Berenstein was 49 in 1851, Levi Bernstein is 55 in 1861, with children named Emma (22), John (20) and James (15). I’d hazard a guess that these are the same people, but they’ve chosen to anglicize their names. Henda, for example, is the Yiddish version of Hannah. I feel a bit sorry for John in that case – who wouldn’t rather be called Wolf? Ages, particularly those of adults, are not always accurate in the census – this was an age when it just wasn’t that important to know your birthday. The house numbers aren’t marked on the census, and my plotting is still ongoing in this respect – however, I think they have probably stayed at the same address. It could well also be then that Hannah died on 19th September 1864 and was buried in Blakenhall. A crumbling tombstone, transcribed as Hannah Bernstone, records her death and burial in English and Hebrew. Canal Street, Wolverhampton, c.1879. Wolverhampton Archives and Local Studies ref P/865. The Bernstein’s house can be seen on this poorly-preserved picture from 1879. 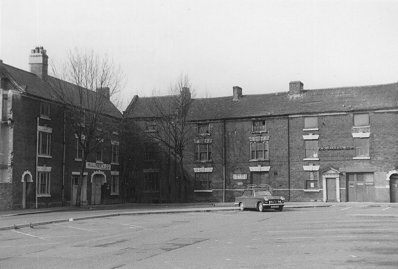 At the end of the foreground row of houses is a protuding building, a corner pub variously called the Crown Inn or the Cheshire Cheese, beyond which is Fryer Street. The house nextdoor to the pub is 64 Canal Street, seen here in 1879. It’s a tall, three-storey building (something that our maps can’t show us) with something of a wall, which also doesn’t appear on our maps. As can be seen from the above map, no.64 was quite private in many respects – it has a bounded back yard with a private privy and its own sewer grate. A respectable property, in other words- both Henri Lefebvre and Martin Daunton point out the privatisation of space in Victorian cities, moving from shared amenities and space to enclosed, ‘personal’ space. If the Irish of this district were perceived as “Other” by respectable Wulfrunians, I wonder how the much smaller Jewish community coped? They may well have dressed differently, and if they were Eastern European migrants like the Bernsteins, spoken another language. Jews were a suspect people for some, politically, economically, culturally. Yet concentration and poverty were not an inevitable outcome for the Victorian Other. A small group of Jews, living in a city where everywhere was walking distance, probably caused little disturbance – and were even honoured by the Duke in being awarded their own graveyard. The Bernsteins seem settled in the house where they raised their family in their adopted town. They even took on the identity of the modern, English world in anglicizing their names. I’m hopeful that, although poverty was on every hand around Canal Street and Stafford Street, there were some migrants who were an accepted and comfortable part of Wulfrunian society.